As you drive west along the Roman Fosse Way from The Gibb crossroads in North Wiltshire, Lugbury Longbarrow can be seen sitting in a field on the right hand side some 350m away. Be careful though, if you’re not looking and drive too fast, it can be easily missed. In my opinion it is best visited in either the spring or autumn, and to find it turn left at The Gibb from the direction of Castle Combe direction and drive along the narrow lane (the Fosse Way) down through the wooded hill. The road crosses a very small stream at the bottom (often dry in the summer months but pretty when in full flow) and then as you clear the wood it rises again. If you are driving, start to slow down at this point for as you rapidly approach another narrow wooded area that crosses the road in front of you, you have reached the closest point to the barrow by road (ST 83383 78504 or 51° 30’ 18.77”N 02° 14’ 26.84”W for those with GPS or Map). There are normally plenty of places to park that are clear of the road and will not obstruct access to the farmer’s fields. Facing west and on the right hand side of the wooded area (called Three Stones Plantation) the sign posted bridleway to the barrow can be accessed via a small gate with one of those ‘long metal levers that pull back a bolt’ arrangements. The field can be quite muddy even in drier weather, and lately in the summer months the barrow has been engulfed in a crop of maize making it almost impossible to see from the tree plantation let alone the road. Walk up by the side of the plantation and providing it is not hidden by crop, the barrow can be seen a little way ahead (at ST 83086 78557 or 51° 30’ 20.48”N, 02° 14’ 42.28”W). Quite often while walking in this area both muncjac and buzzards can be seen along with the normal plethora of bunnies, squirrels and other animals. On a normal day I can’t say the site is particularly tranquil because as you draw near you realise the sound of heavy traffic coming from the M4 to the north. There are also high tension power lines that run from the north over to the west which get in the way of many a beautiful sunset. On cold dark days when the clouds are heavy with rain and the crows bark from the swaying treetops, the place can feel quite foreboding. My son always refers to it as ‘that creepy one’ when we sometimes talk about Lugbury. I however like this barrow, it give you a glimpse that this was once an important place with its three great stones perched at the eastern end of the low mound. If you can get up here on a warm morning in the spring the traffic is much less intrusive, the birds sing from the same trees and life’s problems can be put out of your mind. Just sit down with your back to the stones and enjoy the warm sun, bird song and the solitude. In recent years this barrow was cleared of much of the debris that sat upon it, and the overgrown elder bush and brambles that surrounded the stones were cut back. For a brief period the stones stood proud at the end of the mound in the warm sunshine but nature, as always, wins the day and the barrow is again being engulfed in her green shroud. The elder too is fighting back and is now springing up in at least three different places around the stones. The English Heritage Risk Register describes the barrow as ‘A Scheduled Monument At Risk’ with a declining Trend (EHRR 12290). Unfortunately, and as is often the case, the plough has bitten into the edges of the mound reducing the dimensions over time. The good news is that earlier this year an area around the mound (and well clear of it) has been pegged out. On my last visit in early December this area was still untouched so it looks as if things have changed for the better… at least for the time being. The Wiltshire SMR describes Lugbury as 54.5m long, 24.2m wide and 1.8m high but I am not sure that what can be seen now fits these dimensions and anyway different sources give you different figures… maybe I will get around to measuring it myself one day. The mound itself is quite low at about a metre high at its eastern end. 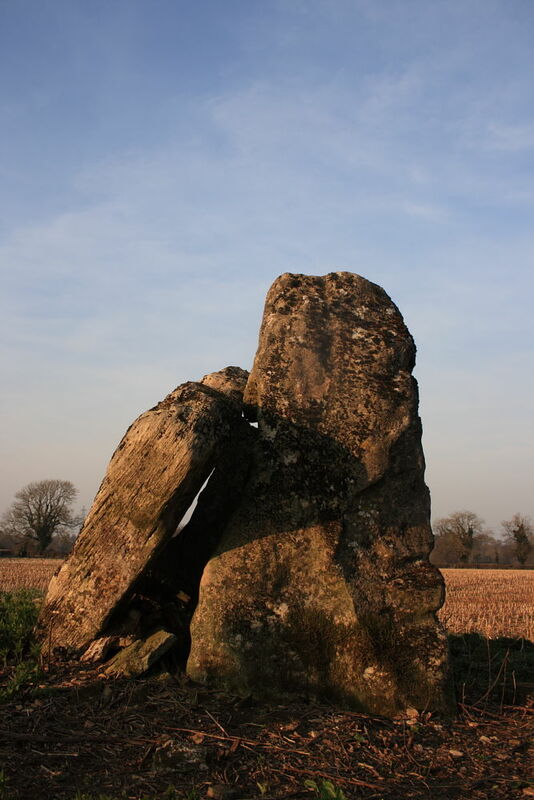 Here are sited the three stones that form an open chamber and make the barrow worth the visit. 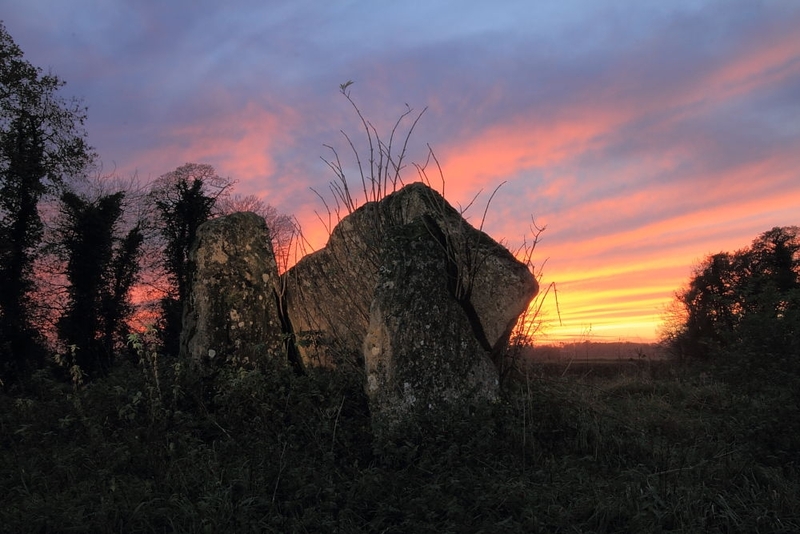 Two of the three stones that form the chamber are approximately 2m x 1m and about 100-200mm thick and are orientated parallel to each other so that a larger stone measuring 2m x 3m rests against them. The SMR suggests that this large stone is a cap stone but others suggest this is the remains of a false entrance. One of the unusual features of the three stones is the large ‘bite’ at the base of the big supported slab. Somebody once told me it had been worked but I am not sure myself. There was another theory that it could have been used to place things inside the mound but I don’t believe there has been anything found there… Who knows! There is a suggestion that the ditches running either side of the barrow, and created during its construction, are still visible. However I have failed to see these even when the lighting conditions have been favourable. We could do with a good aerial photo to check this out. Like the nearby Lanhill a little way to the south the barrow does not command any sort of view from its low lying position but does have the little stream running close by. This is likely to have been significant during the barrow’s use and may have been used as part of the burial and reburial ceremonies that would have taken place. Littleton Drew, Barrow Lane: anyone digging in the vicinity is asked, ‘are you digging for the golden wheel-barrow?’ (Rev. R. B. Lamplugh, vicar, to L.v.G., about 1950.) The Lugbury long barrow (in Nettleton parish) is near. To anybody who is in this lovely area of the Wiltshire-Gloucestershire board, please make room in your schedule for a worthwhile visit to this forgotten place. undergrowth has been cleared around it,i did complain to English Heritage about it. It looks more impressive now.As a pagan i love visiting ancient sites,they are very mystical places.I take my collie dog bilbo with me. Cheers for your comment Andy. I think the Castle Combe & District Historical Society cleared the barrow between Christmas and New Year 2008/2009 rather than EH, but like you said, whoever it was it has improved the place no end. I also used to have a collie and we visited most of the ancient sites in the area but always felt somewhat responsible for Lugbury and Lanhill as they are my closest neighbours. Fantastic stuff, it’s always good to see others taking a real interest in our local ancient heritage. It just so happens I did a bit of an experimental film of the 2010 Summer Solstice Sunrise at Lugbury which was made by taking a series of many photographs and ‘stitching them to gather to get a sort of animation effect. This can also be found on Youtube by putting in Lugbury Sunrise into the search. Isn’t it funny how this little, almost forgotten, place can attract the attentions of people such as ourselves. 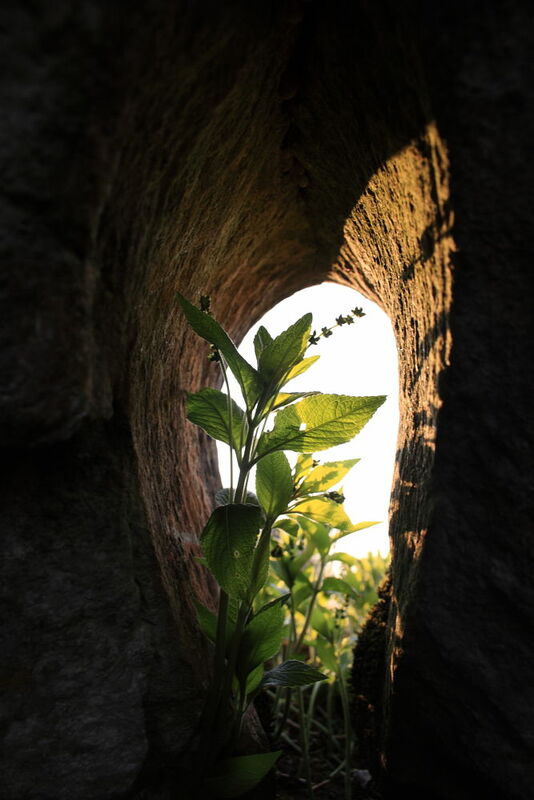 You can watch the short film i made’ Lugbury Longbarrow’ on you tube by just using the name of the film when searching for it.